Over 300 artists from as far afield as Ethiopia, Norway, Japan and Belgium will be taking part in Mofo 2016 events across Hobart next January. Highlights include The Flaming Lips, Evelyn Glennie, Antonio Sánchez, DJ Krush, Jenny Hval, HERMESensemble, State Theatre Company of South Australia and Kate Miller-Heidke debuting new works with the Tasmanian Symphony Orchestra. Mofo 2016—the Museum of Old and New Art’s Festival of Music and Art— will be taking on an exciting new format and offering bespoke events in venues all around Hobart in January. Also on offer is a Three-Day Mona Pass available between 15–17 Jan which will provide on-site festival access as well as museum entry. Curated by Brian Ritchie (Violent Femmes, The Break) the festival is a glorious mix of old and new featuring hundreds of musicians and performers from around the world: the weird and wonderful The Flaming Lips (USA) on the outdoor Mona Main Stage; percussionist Evelyn Glennie (UK) at the Federation Concert Hall; award-winning composer Antonio Sánchez(USA) performing his original drums-only score to a screening of the Academy Award-winning film Birdman; Japanese hip-hop turntablist DJ Krush; Norwegian art-pop provocateur Jenny Hval, award-winning British poet-turned-rapper Kate Tempest and more. Also returning will be MoMa (Mona market) for the three day weekend at Mona, continuing weekly on Sundays from 11am–4pm until 27 March 2016. Faux Mo continues its takeover of Hobart’s empty spaces from 15–17 January, while Brooke Street Pier takes centre stage for pop-up Mofo artists throughout the weekend. 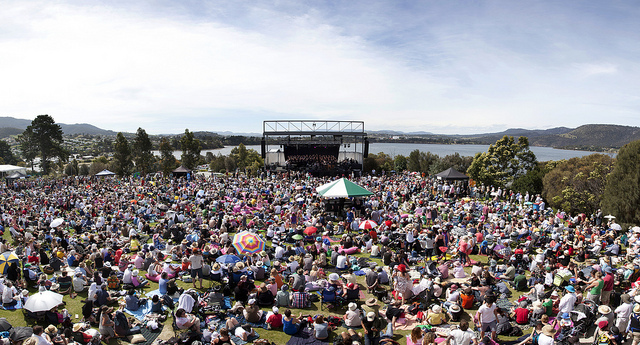 Other Mofo events and exhibitions will be scattered throughout Hobart, at venues including the Federation Concert Hall, Rosny Barn, Moonah Arts Centre, Salamanca Arts Centre’s Peacock Theatre and Kelly’s Garden, Contemporary Arts Tasmania, and even off the ‘big island’ of Tassie, at Alonnah Hall on Bruny Island. Mofo 2016 happens at Mona, 655 Main Rd, Berriedale, Tasmania, as well as Hobart city surrounds. There is a lot to see and do in Tassie, some of which you can book through Mona. Fly into Hobart from your nearest capital city. Stay at one of our recommended hotels, Air Bnb, Couchsurf, or stay with mum and dad. Catch a Mona Roma ferry or bus to/from Mona 13–17 January. Mofo like there’s no tomorrow. Tomorrow comes whether you like it or not. Like it more with some other Tassie attractions.